There are moments in time that seem to last forever. Gazing over crystal-blue waters as wisps of cloud shone bright in the sunset light, I marveled at the scene before me. 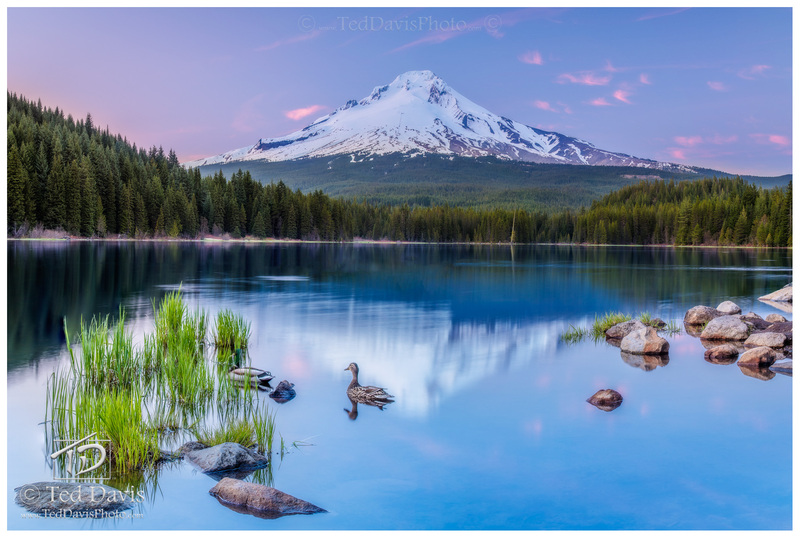 The terrific beauty and symmetry of the mountain framed by sunset clouds reflected in the shimmering lake enchanting me as a pair of mallards splashed, played, and scavenged for food amongst the swaying reeds along the shoreline. A smile etched on my face, this was pure. Then it was over; the glow of the clouds began to fade and the ducks paddled away, leaving me alone as time once again imposed her will. That is the power of moments, so strong one instant yet gone the next. But in that one moment, that instant of perfect serenity, I snapped the shutter down and captured Elysium. Photo © copyright by Ted Davis.